The Great Sandy Desert consists of vast areas in Western Australia and the Northern Territory. A variety of plants grow in the desert’s red-colored sandy plains, sand dunes and rocky outcrops. The desert also consists of wetlands that dot the landscape along the Rudall and Cotton Rivers as well as the Dragon Tree Soak area. 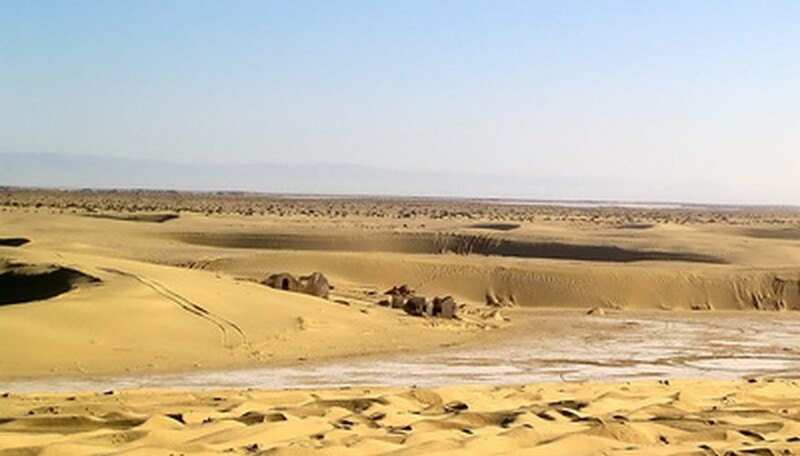 The northern section of the desert features an arid tropical climate and a temperate-tropical climate in the southern regions. Desert Bloodwood grows on the plains of the Great Sandy Desert. The tree grows up to 30 feet in height. The tree features rough bark and sap that looks like thick red blood while its leaves appear tough and leathery. The roots store water for use in dry periods. In April through October, the tree produces yellow and white flowers with nectar that provides food for several desert animals including opossums and insects. A sharp-pointed tussock grass that grows in the form of hummocks, soft spinifix thrives on sand dunes and rocky slopes across the desert. The plant’s long roots grow in a way that allows each stem to pull from its own water and nutrient supply. Aboriginal tribes burn the grass, and then collect the resin from the burning material to use as glue for adhering handles on stone axes. Cattle and sheep also graze on the new growth after burning. Soft spinifex grows up to 6 inches in height, thriving in arid, infertile soil. A thorny tree growing up to 25 feet in height, bramble wattle relies on underground water to thrive in the Great Sandy Desert. The tree features bluish-green leaves with fragrant pale yellow balls of flowers blooming in the spring. Papery pods containing seeds appear after the flowers fade with each seed the size of a lentil. The tree thrives in sunny areas and provides dense shade. The tree grows best in medium to heavy soils or in sandy soils where it rains more frequently. When the tree grows outside the desert, it requires irrigation when blooming. The paperbark tree gets its name from its layered and papery bark. The plant typically grows to about 75 feet in height although it also grows as a smaller shrub in some areas. The tree’s new shoots, covered in thick silky hairs, give the tree a somewhat silvery appearance. Stands of paperbark occur in swampy, coastal areas in humid, hot regions. From March to December, the tree produces flowers that grow up to 5 inches in length. Once the flowers fade, small fruits appear with mature seeds ready for collection in October or November. The oil from the tree makes a good antiseptic as well as insect repellent.